We find ourselves in a smaller community on the outskirts of a larger metropolitan area that still harbors a predominantly old blue-collar, working class, white conservative population, which is similar to those earlier colonial settlers that started exploiting the land for timber. Negative stereotypes rooted in earlier late 1800’s days, still prevail, marking this area as “no the most desirable to live” and therefore, making prices low and habitable for these immigrant communities. However, I believe these stereotypes also give people in power the permission to remove them as gentrification advances. These negative stereotypes could be used against targeted immigrant communities in times of Trump, following up to those hateful fliers depicting latinx people as “drug dealers, criminals etc”, and give more permission to “those in power” to displace people in larger numbers. I believe that by collecting narrative accounts and putting all the different programs and resources that these associations do for the community in one single, attractive and easy to use website, people who are either moving in or afraid that they might be displaced, it will be beneficial! For my final project, I was most interested in discussing architecture, its impact, and importance in the environment surrounding it (which obviously, is extremely broad). I narrowed it down to Seattle and vernacular architecture, with the Craftsman-style bungalow. It is a house that all the locals see every day in passing, but we really don’t give enough attention to. Taking four previous architectural history classes, I honestly hated discussing the history. One of the previous classes had us research a building in Seattle and its historical significance, but I was picking at straws and it was difficult to find enough reliable information. Researching from an historical archaeological perspective was much more interesting, because I surprisingly found so much I could discuss within in my paper. Thankfully, I even had notes on the specific architectural styles that I was discussing, from the classes that I did go to last year! And I still had my architecture textbooks, so it looks like they didn’t end up being a waste of money! Anyway, my topic discusses the influence of previous styles of architecture and their accompanying ideology on the development of the Seattle bungalow, and how it contributed to suburban expansion. The Craftsman-style derives its roots from the Arts and Crafts movement in England, in which reformers found that industrial society was corrupt and they had these Romantic ideals of incorporating real craftsmanship and nature into their designs, whether it was architectural or furniture or textiles. They despised classical architecture and believed in a “no-frills” aesthetic, where artistic integrity should be included within the structure. Planners talked about having garden cities (which I personally, think is a good idea) that had maximum capacities to counter overpopulation in cities. In terms of architecture, houses were built with local materials instead of imported, and there was no geometric order to structures. In America, the bungalow became most prominent in the west coast, starting in California. One of the more famous examples is the Gamble House, or if you’re not crazy and you’ve seen Back to the Future (if you haven’t seen it, you’re a slacker, McFly), Doc’s house. In Seattle, the bungalow became a capitalistic venture more so than an ideological one. Jud Yoho, a businessman advertised Craftsman homes without them being craftsman. They were the same style, but just mass-produced and much cheaper which appealed to buyers. They also included better appliances, and provided families with a sense of security and independence. Characteristic of Arts and Crafts houses, they had open plans, and so the dining room and living rooms had a flowing procession. The more I researched into it, the more I became interested. I feel this is important to talk about because these homes have become characteristic not just of Seattle, but of the Pacific Northwest, and the rise in population growth from companies like Amazon could become a potential threat to pieces of history. The cost of living rises each year (my rent went up $100 in just a year—that’s 50 cups of coffee!) and unless you work at a tech company or some other decently-paying job (or you’re Jeff Bezos or Dr. Meredith Grey), rent does become a burden. It’s a problem that directly affects all of us. My final project for my Historical Archaeology course is a personal narrative formed by historical records and an assemblage recovered from a site in Andover, MA. The site is called the Lucy Foster Homesite, also known as “Black Lucy’s Garden”, which was excavated in 1942 by Ripley and Adelaide Bullen (Martin, 107). The areas that were excavated were the cellar hole, dump, well, vegetable cellar, and lumbermen’s shack on Lucy Fosters acre (Martin, 107). Although these areas all contributed to Lucy’s daily life in someway the only portion of Lucy’s home that still existed was the cellar hole (Martin, 107). The assemblage recovered from this site include material culture that is linked to socializing, labor, and food resources. In the past there has been a lot of focus on the ceramics from this assemblage because it is quite large. They recovered 113 reconstructed ceramics from the Lucy Foster Homesite (Martin, 107). Most of which were serving dishes. It may seem obvious that Lucy Foster was entertaining members of her community based on the significant amount of serving dishes in this assemblage. But the original response to this assemblage was, how did she acquire such a large collection living in poverty? Assuming she lived in poverty because she was black and received financial assistance from the parish. But I think we are missing a major part of her life by only focusing on how she came to have this collection. I believe it is more important to know what she was doing with her ceramics and why a large collection would be important to her. This brings me to my goal for this project. I want to highlight the racial bias that is layered into the interpretation of Lucy Foster and her life. In return I would also like to offer an interpretation that recognizes her ability to cope with adversity and survive. In order to do this I will need to write two personal narratives from both perspectives. It is my hope that seeing these perspectives side by side may encourage others to identify the layers of bias that are woven into historical records and research. By recognizing these biases we can develop more accurate interpretations of the past and create an opportunity for communities to heal from the pain created by these distorted perspectives. Martin, Anthony. “Homeplace Is Also Workplace: Another Look at Lucy Foster in Andover, Massachusetts.” Historical Archaeology, vol. 52, no. 1, 2018, pp. 100–112. This week we were instructed to make a digital story based on our family history. I chose to tell the story of how my family was formed. Specifically the way in which we met each other and how we grew to love each other. This story is important to me because my family is the most important part of my life. They are the people that have made me who I am and keep me grounded. This is the story of our beautifully diverse and wonderfully complicated family. For my digital storytelling assignment, I chose to talk about me and my apa’urlaq (Yup’ik for grandfather). He led an interesting and full life which had a huge impact on me and my education. He was one of the first Alaskan Natives to graduate from the University of Alaska Fairbanks. Taught himself French, German, and was fluent in several Yup’ik dialects. Unfortunately I did not learn much about my Native roots from him and by the time I wanted to learn, it was too late. This has really driven me to pursue learning about cultural traditions and cultural preservation. As part of the first generation born in America in my family of Philippine immigrants, I have much to be thankful for. I can’t imagine how much more different my life would be if I had grown up in Manila, where my parents came from. My mom’s side, the Villenas, are from Manila, and my dad’s side, the Mangaser side, is from a small town called Tayug in a province called Pangasinan, which is three hours outside of Manila. Born in 1964 to my grandpa Benjamin and grandma Flora, my dad, Victor Bravo Ferdinand Mangaser (long name, I know) is the youngest kid out of ten children. My mom, Luzviminda Villena, was born a year later, and is the oldest kid out of five from my grandpa Rudy and my grandma Mila. The Mangasers lived in Pangasinan for a while before moving to P. Halili Street in Manila, coincidentally the same street as my mom’s family. I thought it was significant to mention the street where they came from, because they both still have family that live on the same street, in the same homes. My parents tell me that my mom didn’t like my dad at first, because my dad was apparently in a band so they played music all the time, and my mom didn’t like that. Same as usual, my dad also always teased her. When they got married, one of my (many) uncles on the Mangaser side, Uncle Ben, had moved to New Jersey and petitioned all of the Mangasers to come to the United States in the 1980s. At around the same time, my dad had joined the United States Navy and my mom was in the process of gaining citizenship, which took around 10 years and two rejections, despite having a U.S. military spouse. I can’t imagine why it took so long, to be honest. Eventually, I came to be in October of 1998, when my dad was stationed in California. From there, we made our way up to a small town north of Seattle called Lake Stevens. In 2004, my grandma Mila was able to come to the United States and gained citizenship three years later. You’d think that the rest of the Villena family came along too. Though my grandma petitioned the remaining Villenas living in Manila (long ago, I might add), their applications haven’t been accepted (yet?). I am proud of where I come from as a Filipino-American. Granted, I’m definitely more Americanized as I can’t speak Tagalog or Ilocano (my dad’s native dialect), and growing up I used to be embarrassed to show common Filipino signs of respect, like adding po to the end of every sentence, or performing mano to elders. And growing up in America with parents who grew up in Asia, was (and still can be) difficult. Nonetheless, my family coming to America for a better life for their kids, my sister and I, has always meant a lot to me. It meant a lot of hard work, learning, and adjusting to a new way of life, something I couldn’t imagine doing in my late 20s. The past couple of weeks our class has been working on identifying glass bottles found at archaeological sites by examining an assemblage recovered from the former tidelands off of the former 6th Ave South viaduct in Seattle. Most of the bottles are exactly what you’d expect: beer bottles, medicine, condiments, that kind of thing. But a couple of the bottles present more of a mystery. One such bottle is the one I’ve just been calling the “owl bottle.” For the most part it’s not a very exciting bottle, it’s tall, clear, and cylindrical with a wide opening and some light patination, but on the base of the bottle is an owl perched on a crescent moon and the word “trademark” is embossed within the moon. When I first saw this mark I got excited, partly because it’s pretty, but mostly because I figured it would make the bottle really easy to identify. I was very wrong. The closest I came to identifying this mark was a reference to the logo for Gillet’s High Grade Extract, a company that does indeed use an owl on a crescent moon for its logo. 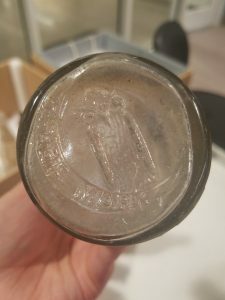 Unfortunately the owl is slightly different, the word trademark is not present within the moon (at least not on any pictures I could find), and the owl is shown on the side of the Gillet bottles rather than the base. I thought maybe that it was a one-off that they had manufactured beforing changing their minds about which direction to go with the logo but there are so many differences that there’s just no way for me to be sure. One thing I do know is I’m going to be looking oddly closely at any bottles with owls I see in the future and maybe someday I’ll know the answer! This week I was faced with the challenge of interpreting historic glasswares for my Historical Archaeology course. At first I thought this project would be quick, simple and easy. But I quickly discovered this task was in fact challenging and required close observation. Who knew there were so many different manufacture methods and container shapes? The finish, which includes the bore and lip of a bottle, quickly became my greatest challenge. Thankfully the Society for Historical Archaeology has a bottle identification website that is very helpful when you are stumped. For example, I was examining a bottle that was aqua in color and cylindrical in shape. The base was shallow and concave with a pontil mark. A pontil mark is a type of scar that is left when the iron rod is removed from the bottle. The seam along the base indicates a 2-piece cup bottom manufacture method. Which involves a mold with a separate base plate. Based on my observations I concluded the bottle was used for soda or mineral water. But the finish threw me for a loop because it was a crown shape. Which is typically seen on beer or ale bottles. Thanks to the Society for Historical Archaeology website I was able to confirm the bottle was used for soda. Next I researched the makers mark to confirm the period of use. The bottle was marked with “Fox Trademark J.G. Fox & Co. Seattle, WA”. J.G. Fox & Co. was a beer and soda bottler in Seattle, WA from 1850-1910. I was unable to find any information about marketing and their demographic. But it is clear they were popular for the area where this assemblage was collected. There were several similar bottles in this collection with the same color, shape, and makers mark. Perhaps the site where they were collected was a dump for retailers. Or maybe it was the drink of choice for the nearby population. This will require further research that goes beyond my glassware knowledge and interpretations. For this week, our class analyzed glass bottles from a dump, and see how they were manufactured, and what they could have possibly been used for. I never realized the differences between bottles and how their shapes and finishes could reveal how they were used. It’s clear a champagne bottle is used for champagne, and a soda bottle for soda, but I never realized why. Then we characterized the age of all the bottles from the class data, and find the average age of each type of bottle. For example, the median age of beer and ale bottles was 1896 out of 12 dateable bottles. The median age of food containers was around 1900, but out of the nine bottles, only six were dateable. From these ages, we determined the lag by subtracting the average from the year the dump was sealed off, which was in 1929. So the lag between the year it closed and the age of the beer bottles is 33 years. Then, we were to choose a bottle ourselves and describe what it was used for. As seen below, the bottle seems to be a soda/mineral bottle. It has a crown finish, and possibly had a paper label. However, when and where the item was manufactured remains a mystery as there is no manufacturer’s date or label. Being a soda bottle, it was probably used by an average Joe who decided to drink some soda on a hot day (or a mild day, it’s Seattle).